عبدی, علی, صالحی کلام, ارسلان, سیامردی, کیانوش, رحمانی, امید. (1395). آنالیز پدیده هیسترسیس در جریان ترافیک حرکت – توقف مبتنی بر رفتارسنجی راننده پس از آشفتگی. پژوهشنامه حمل و نقل, 13(4), 76-96. علی عبدی; ارسلان صالحی کلام; کیانوش سیامردی; امید رحمانی. "آنالیز پدیده هیسترسیس در جریان ترافیک حرکت – توقف مبتنی بر رفتارسنجی راننده پس از آشفتگی". پژوهشنامه حمل و نقل, 13, 4, 1395, 76-96. عبدی, علی, صالحی کلام, ارسلان, سیامردی, کیانوش, رحمانی, امید. (1395). 'آنالیز پدیده هیسترسیس در جریان ترافیک حرکت – توقف مبتنی بر رفتارسنجی راننده پس از آشفتگی', پژوهشنامه حمل و نقل, 13(4), pp. 76-96. عبدی, علی, صالحی کلام, ارسلان, سیامردی, کیانوش, رحمانی, امید. آنالیز پدیده هیسترسیس در جریان ترافیک حرکت – توقف مبتنی بر رفتارسنجی راننده پس از آشفتگی. پژوهشنامه حمل و نقل, 1395; 13(4): 76-96. مقایسه رفتار حرکت - توقف زنجیره وسایل نقلیه در آزادراه‌ها بر اساس داده‌های عبوری برداشت شده در هنگام خروج از آشفتگی ترافیک با رفتار زنجیره وسایل نقلیه در حال نزدیک شدن به آشفتگی ترافیک که بیانگر تاخیر در بازیابی سرعت در زمان خروج از آشفتگی ترافیک می‌باشد، سبب تشکیل پدیده هیسترسیس در جریان ترافیک می­گردد. تئوری‌های مبتنی بر نامتقارنی رفتار راننده در فاز افزایش و کاهش شتاب در تحلیل پدیده هیسترسیس جریان ترافیکی، به طور کامل قادر به تحلیل پدیده هیسترسیس ندارند و نیاز به توسعه بیشتری دارند. در این تحقیق با استفاده از مدل وسیله نقلیه تعقیب خودروNewell ،پارامترهای اثر گذار بر دامنه پدیده هیسترسیس (مبتنی بر رفتار راننده پرخاشگر و محتاط)، مورد ارزیابی قرار می‌گیرد. سپس با مدل سازی نمودن پدیده هیسترسیس مبتنی بر شبکه عصبی و بهینه سازی لایه‌های شبکه عصبی به وسیله الگوریتم ژنتیک، تحلیل حساسیت رفتارسنجی راننده در جریان ترافیک در سطح جزیی نگر با سرعت موج ثابت ارزیابی می‌گردد. همچنین، درجریان ترافیک با سرعت موج متغیر با استفاده از مدل موج سینماتیک به وسیله تغییرات تدریجی سرعت و سرفاصله مکانی، دامنه پدیده هیسترسیس نسبت به سرعت موج ثابت آنالیز می‌گردد. نتایج نشان می‌دهد که نوع شکل حلقه‌های پدیده هیسترسیس ترافیکی بستگی به رفتار راننده دارد. دو پارامتر سرفاصله مکانی و افزایش شتاب در انتهای پدیده به عنوان مؤثرترین پارامترها در تحلیل حساسیت رفتاری راننده معرفی گردیدند و دامنه پدیده هیسترسیس در شرایط سرعت موج متغیر، مقادیر کمتری را نشان می‌دهد. Delay in recovering the speed of the vehicle results in occurrence of the hysteresis phenomenon in traffic flow the disturbance. The fundamental theories to analyze the hysteresis phenomenon based on driver behavior asymmetry during acceleration, and deceleration phases are open research area and need more developments. In this paper, which is the review of recent efforts in understanding hysteresis; using a Newell`s car following model, are reviewed to study the effects of different parameters on the magnitude of the motioned phenomenon. Moreover, the hysteresis phenomenon based on aggressive and timid driver behavior was identified. Microscopic sensitivity analysis and its results are shown by considering a conducted research based on the modeling of the phenomenon by neural network, and optimizing hidden layers of the neural network using genetic algorithm. Furthermore, in non-stationary traffic flow by using the kinematic wave model in variable wave speed; the magnitude of the hysteresis was estimated by a gradual analysis of the speed- density relationship. The results showed that the shape of traffic hysteresis loops depend on the driving behavior. Also, Spacing and acceleration at the end point of the phenomenon are considered as the most effective parameters in the sensitivity analysis related to driver behavior. Last but not least, it was found that the hysteresis magnitude in the non-stationary condition resulted in the lowest amount. - Bilbao-Ubillos, J., (2008), the costs of urban congestion: estimation of welfare losses arising from congestion on cross-town link roads. Transportation Research Part a 42 (8), pp. 1098–11082- Authors of the paper, Date, Title of the paper. Conference Title, Pages. (Times New Roman 10). - Zheng, Z., Ahn, S., Chen, D., Laval, J., (2011), Applications of wavelet transform for analysis of freeway traffic: bottlenecks, transient traffic, and traffic oscillations. Transportation Research Part B 45 (2), pp.372–384. - Zheng, Z., Ahn, S., Chen, D., Laval, J.A., (2011), Freeway traffic oscillations: microscopic analysis of formations and propagations using wavelet transform. The 19th International Symposium on Transportation and Traffic flow Theory, pp.717–731. - Ahn, S., Cassidy, M., (2006), Freeway traffic oscillations and vehicle lane-change manoeuvres. In: Heydecker, B., Bell, M., Allsop, R. (Eds. ), Forthcoming in 17th International Symposium on Transportation and Traffic Theory. Elsevier, NewYork. Lane-changing in traffic streams. Transportation Research Part B 40 (3), pp.251–264. - Koshi, M., Kuwahara, M., Akahane, H., (1992), Capacity of sags and tunnels in japanese motorways. 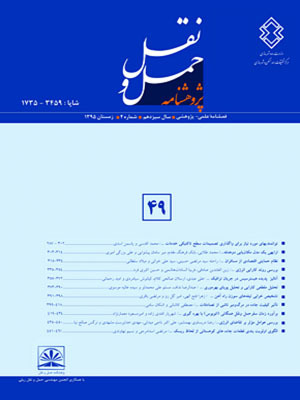 ITE Journal (May issue), pp.17–22. - Laval, J. A., (2006), stochastic processes of moving bottlenecks: Approximate formulas for highway capacity. Transportation Research Record 1988, pp.86–91. - Newell, G.F., (1962), Theories of instability in dense highway traffic. Journal of the Operations Research Society of Japan 5, pp. 9–54. - Edie, L.C., Baverez, E., (1967), Generation and propagation of stop–start traffic waves. In: Edie, L.C. (Ed. ), Proceedings of the 3rd International Symposium on the Theory of Traffic Flow. Elsevier, New York, pp. 26–37. - Laval A. J. (2009), Hysteresis in the fundamental diagram: impact of measurement methods, 89th Annual Meeting of the Transportation Research Board, Washington, D.C.
- Zhang, H. M. A mathematical theory of traffic hysteresis. Transportation Research Part B, Vol. 33, 1999, pp. 1-23. - Cassidy, M.J., 1998. Vicariate relations in highway traffic. Transportation Research Part B 32 (1), pp. 49–59. - Laval, J.A., (2005), Linking synchronized flow and kinematic wave theory. In: Schadschneider, A., Poschel, T., Kuhne, R., Schreckenberg, M., Wolf, D. (Eds. ), Traffic and Granular Flow ’05. Springer, pp. 521–526. - Newell, G.F., 2002. A simplified car-following theory: a lower order model. Transportation Research Part B 36 (3), 195–205. - Laval A. J. Hysteresis in Traffic Flow revisited: An improved measurement method, Transportation Research, Part B. 2010, Vol. 45, No 2, pp. 385–391. - Coifman, B., 1996. Time space diagrams for thirteen shock waves. Tech. Rep., University of California – PATH. <http://www-ceg.eng.ohio-state.edu/coifman/documents/TSW.pdf>. - Sugiyama, Y., Fukui, M., Kikuchi, M., Hasebe, K., Nakayama, A., Nishinari, K., Tadaki, S., Yukawa, S., 2004. Traffic jams without bottlenecks experimental evidence for the physical mechanism of the formation of a jam. New Journal of Physics 10 (033001). - NGSIM, (2006), Next generation simulation. <http://ngsim.fhwa.dot.gov/>. - Karlaftis, M. G., and E. I. Vlahogianni. (2011), Statistics versus Neural Networks in Transportation Research: Differences, Similarities and Some Insights. Submitted to Transportation Research Part C: Emerging Technologies. Vol. 19, No. 3, pp. 387-399. - Principe C. J., R. N. Euliano, and W. C. (1990), Lefebvre. Neural and Adaptive Systems – Fundamentals through Simulations. John Wiley & Sons, Inc.
- Hornik K. M., M. Stinchcombe, and H. White, (1990), Universal Approximation of an Unknown Mapping and its Derivatives using Multilayer Feed forward Networks. Neural Networks, Vol. 3, pp. 551-560. - Vlahogianni, E. I., M. G. Karlaftis, and J. C. Golias, (2005), Optimized and meta-optimized neural networks for short-term traffic flow prediction: A genetic approach. Transportation Research Part C: Emerging Technologies. Vol. 13, No. 3, pp. 211-234. - Soyoung Ahn,Sravani Vadlamani, Jorge Laval (2011), A method to account for non-steady state conditions in measuring traffic hysteresis. Transportation Research Part C.
- Ahn, Soyoung, Sravani Vadlamani, and Jorge Laval. "A method to account for non-steady state conditions in measuring traffic hysteresis." Transportation Research Part C: Emerging Technologies 34 (2013): 138-147. - Foteini P. Orfanou ,et al. Identifying features of traffic hysteresis on freeways. TRB 2012 Annual Meeting.